With your choice of protein: *Chicken, *Ribeye Steak, *Shrimp, *Sausage. 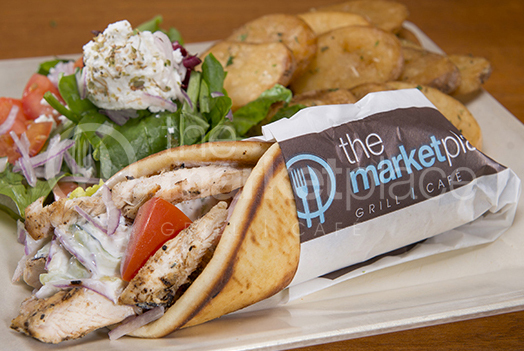 Grilled Pita Bread Filled With Your Choice Of Protein, Our House-made Tzatziki Sauce, Topped Off With Raw Onions, And Roma Tomatoes. Sausages Available: Italian Or Louisiana. Sides Available: Fruit, Hummus, Jalapeno Hummus, Sweet Potato, Veggies, Greek Feta Fries, Risotto, Hot Or Cold Quinoa Salad, Onion Rings, Tzatziki, Pita Bread, Loaded Mashed Potatoes, Natural Cut Potatoes, Greek Salad, Asian Salad, Horiatiki Salad, (Soup $1.50 More).